The issue I'm having is that the computer constantly gets the BBOD (spinning Beach Ball Of Death) when performing everyday tasks. The BBOD will not resolve, even if I leave it over a few hours, so I eventually need to restart the computer. This can happen frequently, ranging from a few times in an hour to once a day. I have kept a detailed log of each freeze (time, what I was doing, general state of the system) and do not notice any triggers. As of late I have been getting error reports in the console associated with a few BBOD episodes. This may help diagnose the issue, though I don't know how to dissect the error reports very well. The only thing I can discern is that the Exception Type is SIGBUS which I've heard is usually RAM associated. An error report is attached at the end. Exchange RAM/test sockets by leaving one module in and observing behavior (bank 1 seems to act up more than bank 0, but the freezing still occurs regardless of which bank a lone module is in. I've also used different RAM sticks to make sure it isn't the RAM, having a 1gb;2gb;4gb at my disposal). It seems to be a hardware issue at least. I'm quite sure the RAM is alright, since in desperation I sent back a kingston 4gb stick that I thought was the source of the issue. The current configuration is 1-4gb kingston module in bank 0. Previously I've had a 2gb and 4gb module (2gb from Apple; original purchase. 4gb; upgrade-put in by me) in, but it acted up at a higher frequency. Let me know if any more information would help diagnose the issue. I'm a bit lost. @Ashley mentioned it could be related to file corruption in Keychain files. 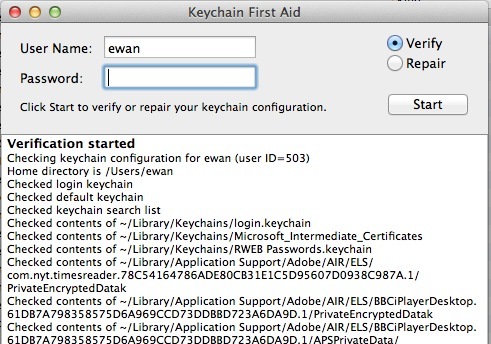 Not widely known but KeyChain has its own First Aid utility which can be used to Verify or Repair the keychain files. the crsud process, which apparently is to do with security (code signing, software update and trust evaluation: see this discussion), has crashed. the type of error was EXC_BAD_ACCESS, which is a failure when accessing memory. the area of memory it was trying to access was actually a file mapped into memory, and the file(s) were /private/var/db/*. Sorry this isn't a complete answer (and bear in mind some of this is guesswork), but perhaps it provides another direction for things to try? From your original question there isn't enough strong evidence this is an hardwrae or software problem. To eliminate most of the hardware origins, please run: Apple Hardware Test before attempting any other tinkering with the system. Run it in extended mode and for at least 4 consecutive passes. Once this 1st cause of trouble eliminated, please read the answer from Ashley and run Disk Utility from another disk than your system one. Most probably your internal filesystem is in bad state since you regularly crash your system. Hence at every new boot the journal (of the filesystem) has to be used again to rebuild everything, and long processes killed have to start again their tasks. Once this 2nd major cause of trouble eliminated, you will conclude that you most probably have a software problem, and it might be time to locate it. For this you will have to create a test account and use it for a serious amout of time, and with all the applications. Do you experience the same hangs with this test account? If yes, then you have a general MacOS X misbehaviour. In this case, you have to reinstall MacOX X Lion. If not, you will have to locate which application within your environment is causing this misbehaviour. the top lines continuously refreshed by this command will show you if something abnormal is happening at the level of virtual memory or CPU usage, within seconds of the original problem. 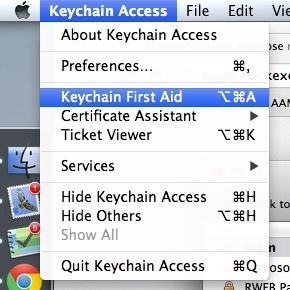 There are some very helpful tools included with OS X that I have used to diagnose this issue in the past. They are all command line utilities, as usually the Spinning Wheel of Death will leave you without a working graphical interface with your computer. If you are able to launch Terminal.app, you may be able to run them this way. However, I've found that in some more extreme cases of lockup that my Macbook's display is just black and all I can see is the SWoD. In this case, it is very helpful to have SSH remote access enabled for the machine. You may follow this tutorial to enable SSH. The following utilities can shed some light on the processes that may be using too many system resources and causing the lockup. Read the manpage for more detail on each. htop - Available via Homebrew: brew install htop. Like top, but with color UI and more sorting options such as Process Parent/Child Tree view. vm_stat - Installed with OS X. Shows Mach kernel Virtual Memory statistics (how much disk space you're using for "VRAM"). nettop - Installed with OS X. Shows a top-style live updating list of processes using network I/O. Helps if you have a very wide terminal. You may find some interesting clues here. If all else fails, and you're not sure what's really hung... you may want to try killing WindowServer. This is a trick which I have used to solve the problem a couple times when all I see is a black background & SWoD. Once you kill it, it should come back and dump you back to the login screen. That will give you the process ID of the offending process, which you can then look up in ActivityMonitor. The tricky thing about this issue is that something opening up the maximum number of files can spike the CPU usage of applications other than the offending process as well as cause the BBOD and random crashes. In my case it was the NullRiver MediaLink prefpane and it was particularly affecting Chrome, but also Adobe Illustrator and Spotlight (inducing crashes in all three cases). It could be a completely different process or app causing the issue for you. All 3 of these affected programs open a lot of files themselves, so they were the most heavily affected by the OS saying "Nope, can't open any more files, we're all out of file descriptors." Killing the prefpane and then updating it to the latest version resolved my issue permanently, but I needed the command above to track down the cause. Your description of what was happening almost exactly matches what was happening for me, so it's very possible that something opening too many files could have been the root cause for you as well. Since it's several years later, I'm going to assume this issue is no longer plaguing you, but other visitors from Google may find it helpful. Just fought through the problem of SBBOD or SWOD if you will, after startup on my 2006 macpro tower running is 10.6.8. Turns out, in my case, it had to do with IPv4 and IPv6 in the network settings panel and AirPort. The problem started when I switched from cable to fi-optics. Apparently, the fi-optics modem is not ready for IPv6. Go into system preferences/network Choose the TCP/IP tab Click on the "advanced" button Use the configure IPv6 pull down menu and select "off"
This works in 10.6.8. Newer systems may vary a little, but the process is similar. Have not found this answer anywhere online. Hope this helps someone. Tried many of the other solutions, this is the only one that worked for me. To solve this, I figured that it must be something in my ongoing software that I use in the background that I hadn’t taken into account. I ran Activity Monitor, clicked on CPU and the %CPU column and discovered the culprit: MagicJack. I had never noticed before was the INSANE amount of System resources it gobbles up. In terms of %CPU the mjdev and the MagicJack app itself use upwards of 15-20 percent of CPU at all times it is plugged in and running! As soon as I quit MJ and disconnected it, guess what: no more beach ball, and things are running as snappy as in the Snow Leopard Days. MagicJack was hogging so much CPU time that the System had to wait its turn constantly, hence the Beach Ball. Not the answer you're looking for? Browse other questions tagged lion macbook hardware memory hang . What can I do about frequent beach ball Safari and other apps? How to diagnose repeated OS X hang / spinning ball of death?